This protocol describes the detailed experimental procedure for stem-loop poly(A) tailed RT-PCR using SYBR Green I. The procedure begins with reverse transcription of poly(A) tailed total RNA, or small RNA-enriched RNA, miRNA, siRNA, etc. The cDNA is then used as template for real-time PCR with gene specific primers. You may need to modify this protocol if you use different reagents or instruments for real-time PCR. In stem-loop poly(A) tailed RT-PCR method, total RNAs, including miRNAs, piRNA, or siRNA, etc. are extended by a poly(A) tailing reaction using poly(A) Polymerase and ATP. 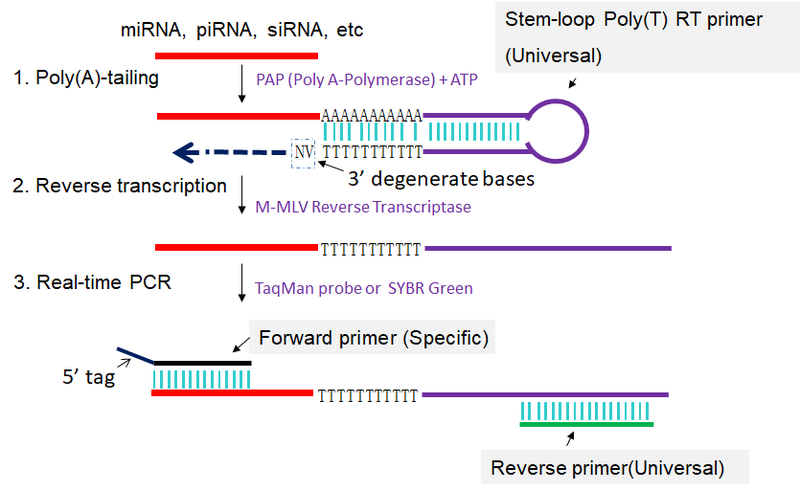 The sncRNA with a poly(A) tail is converted into cDNA through reverse transcription primed by a universal stem-loop poly(T) RT primer, and then PCR-amplified using a specific forward primer and a universal reverse primer (Fig 1). The RT-PCR amplification can be monitored by real-time detection or by end-point detection for quantifying the sncRNA transcript level. This method was invented by Dr. Shengsong Xie, and has applied for China Creative Patent (Patent applied number is 2016107850720). Fig 1. Scheme for stem-loop poly(A) tailed RT-PCR. 1: Poly(A) tailing of sncRNA using poly(A) Polymerase and ATP. 2: Reverse transcription of poly(A) tailed sncRNA primed by a universal stem-loop Poly(T) RT primer. 3: First-strand cDNAs of poly(A) tailed sncRNAs are amplified in PCR by using specific forward primer and reverse primer complementary to stem-loop Poly(T) RT primer. N stands for A, T, C and G, V stands for A, C and G.